Koch Baghdadlian found his calling early. 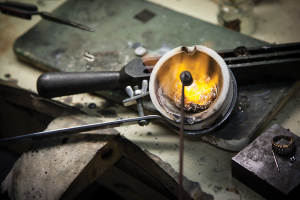 He was 11 years old when he left school in Damascus, Syria to become an apprentice jeweler. His family is Armenian, part of the diaspora, displaced almost a century ago by the Armenian genocide. Driven from their homes by the Ottomans, the Baghdadlians and many other Armenians found their way to Damascus, where they kept their trades alive. At 72, he seems unable to abide the idea of retirement. He arrives at Le Belle Cezanne, his family-run jewelry store, every morning at precisely 8:45. While this may just appear to be Baghdadlian’s comfort with a long-practiced routine, it seems more the result of a personality that strives for precision and perfection. By the time he was 15, he was setting rose diamonds and thinking about the world beyond Syria. 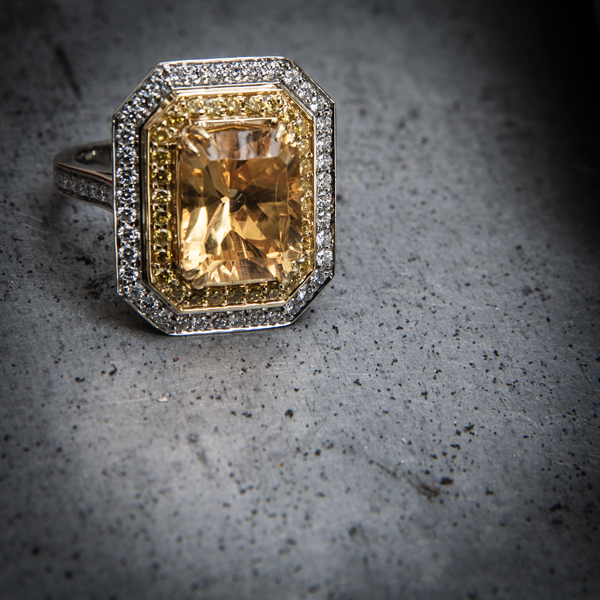 His skill and ambition led him first to Egypt—where he operated a jewelry factory—through Europe, and eventually to New York’s Diamond District in the 1970s. A decade later, he brought his family to Annapolis, and a few years later opened Le Belle Cezanne on Main Street. When the business outgrew its original space, Baghdadlian seized the opportunity to create a shining showroom halfway up the street on the first two floors of a new building. The modern facade sports a pair of large bay windows set like facet-cut stones, much like the jewels inside. It’s very sharp and sophisticated and feels a little European. When you meet Baghdadlian in this urbane setting, you might expect him to be dressed in an impeccably tailored Armani suit, to be suave and smooth, and maybe a bit unctuous. But you’d be wrong. He’s a craftsman, and when you shake his hand you will feel the grit on his fingers. His workroom brings to mind the kitchen of a fine restaurant where the chef hasn’t quite adopted the notion of being a public figure. 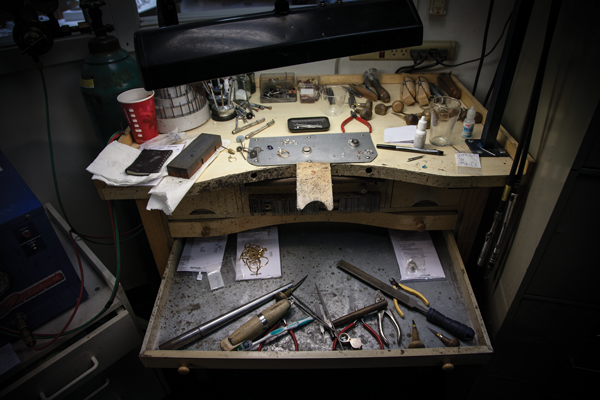 There are windows that allow customers to look in at his bench and tools—a reminder that the creation of jewelry is still best done by hand. If the showroom is like an elegant dining room, a polished display of gleaming perfection, the workroom is the kitchen. There is noise, flame, and a sense of the human labor behind the well-crafted presentation in the front of the house. Everything is well-used. A shelf sags on a wall while a set of hand tools, their handles smoothed and burnished from decades of use, sits on a workbench. A hand-cranked machine used to extrude metals into proper shapes is the sibling of the pasta machines in every trattoria and fine ristorante worth your attention. Baghdadlian is busy with his pneumatic drill, using one of the dozens of tiny bits neatly aligned on a magnetized rack. 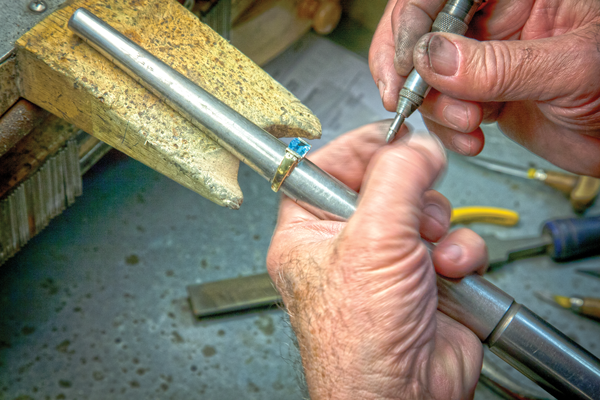 He is working on a ring, resetting a diamond and meticulously nudging tiny gold prongs into place. The drill is one of the few things in this workshop that has received a technological advance in the past 60 years. It has replaced the hand-powered drills Baghdadlian used to learn his craft in Damascus, but it is still a long way from high tech. The only thing with a microchip in the room is the wall-mounted television tuned to The Price is Right, which is about as retro as you can get. Error: Error validating access token: Session has expired on Saturday, 09-Mar-19 15:57:50 PST. The current time is Tuesday, 23-Apr-19 01:31:25 PDT.